These pie charts shows proportion of journey made in the Netherland according to transport type: car, train, bicyle and other public transport in 1975 and 2000. Overall, car traffic is the only transport type which its proportion of journey increased. In 1795, train traffic was the most common transport type in the Netherland which contributed the largest proportion of journey around 35 percent. Car and bicycle also were the main transport types in this country with 25 percent and 23 percent respectively. While other just made 5 percent of journey. In 2000,we see the increase in proportion of journey car made with almost 75 percent. This put car traffic on the top of these transport type. Train became the second popular type with 15 percent while this bicycle's proportion was 6 percent and other's was 4 percent. I have highlighted the text with errors. These pie charts shows (missing word) proportion of journey made in the Netherland according to transport type: car, train, bicyle and other public transport in two different years: 1975 and 2000. In 1795, trains traffic was the most common transport type in the Netherland which contributed the largest proportion of journey (wrong form, missing punctuation) around 35 percent. Car (wrong form) and bicycle (wrong form) also were the main transport types in this country with 25 percent and 23 percent respectively. While other just made (wrong ord) 5 percent of journey. In 2000,we see the increase in proportion of journey car made with almost 75 percent. (ungrammatical) This put car traffic on the top of these transport type. Train became the second popular type with 15 percent while this bicycle's proportion was 6 percent and other's was 4 percent. 1. "which its proportion of journey increased. (ungrammatical. Incorrect use of relative pronoun.)" can be replaced by " whose proportion of journeys increased" right? 2. "other just made (wrong ord)" ",we see the increase in proportion of journey car made with almost 75 percent. (ungrammatical)".Plz, explain these to me! Finally, your feedback is very helpful. However, sometimes, i'm till confused with some mistakes.So, plz, could you explain more detail right next to each mistakes and recommend me some right form of them after that.? Once again, i'm very grateful for this! Hoa Ha 1. "which its proportion of journey increased. Hoa Ha " whose proportion of journeys increased" right? Overall, car traffic is the only transport type which had an increase in the percentage of journeys. Hoa Ha 2. "other just made (wrong ord)"
My typo. Should be "wrong word". While the others accounted for 5 percent of the journeys. Hoa Ha So, plz, could you explain more detail right next to each mistakes and recommend me some right form of them after that.? That would take a lot more time and effort. I try to help a lot of students, and have limited amounts of time to spend on each essay. If you do not understand your mistakes, ask specific questions about them. 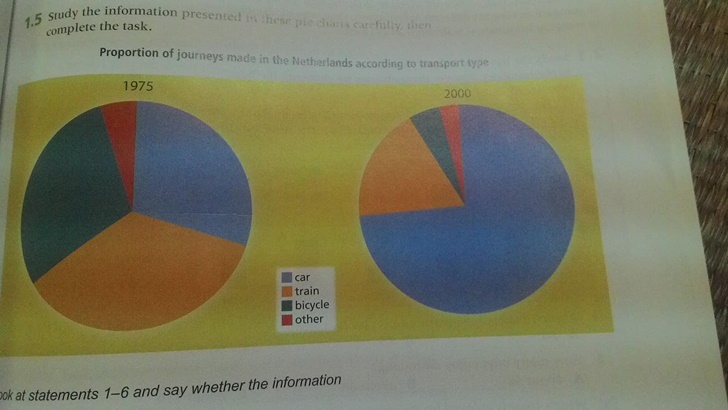 The two pie charts (1975 and 2000) compare the relative usage of three different specific transport types (car, train, bicycle) for journeys made in the Netherlands. Since these three categories did not add up to 100%, there is a fourth "miscellaneous" category for all other forms of public transport. Overall, there was a three-fold increase in the percentage of trips taken by car between the two years, from just over one-quarter in 1975 to nearly three-quarters in 2000. This largely displaced bicycling, which declined nearly five-fold, from over 25% to about 6%, and train trips, which decreased about 50%, from 35% to 15%. The miscellaneous category was rather insignificant, 5% or less, for both years. In 1975, the largest percentage was taken by train travel, amounting to 35%. In second place was private cars, with 25% and a close third was cycling, with 23%. In 2000, the pattern was substantially changed, with cars being the dominant mode of transport with a 75% share. Trains had 15%, and cycling, 6%. Plz, keep correcting my assay for the next time. Writing A Letter Of Purpose - May Anyone Help Me?